Tom Waumsley scores the opening goal for Spalding against Rainworth Miners Welfare. Holbeach were denied victory in the top-of-the-table clash in the United Counties Premier Division by an injury-time equaliser from leaders Rushden & Diamonds at Carter’s Park yesterday (January 24). The Tigers were the better side for most of the game and deservedly led through Jamie Clarke before Diamonds found their late leveller. Holbeach are second, eight points behind the leaders with four matches in hand. The draw was a great result for third-placed Yaxley who maintained their outside chance of top spot with a 4-1 home win over Eynesbury. The visitors led early on, but two goals from Rob Hughes, another from Scott Carter and an own goal moved ‘The Cuckoos’ to within three points of Holbeach. Wisbech have the games in hand to put pressure on the top three and they continued their excellent form with a convincing 3-0 win at Oadby. Midfielder Steven Reid scored twice after Matt Lunn had fired ‘The Fenmen’ in front just past the hour mark. 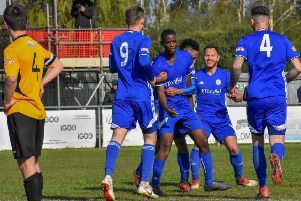 Peterborough Northern Star conceded an equaliser five minutes from time at Desborough, while Jezz Goldson-Williams claimed his 20th United Counties League goal of the season as Deeping Rangers drew 2-2 at Wellingborough Town. Huntingdon won for the first time under the care of city man Ian Edge. Debutant Tom Mann and Charle Sanders scored in a 2-1 win over Sileby. In Division One second-placed Peterborough Sports dropped two vital points in their push for promotion. They led against Wellingborough Whitworth through Gary Gibbs, but the visitors equalised in the first-half from the penalty spot. Bourne lost for the first time in seven matches, 2-0 at Lutterworth thanks to two goals in the final quarter of the game. Lutterworth now join Sports on 54 points. Blackstones picked up their first point under manager Neil Cotton thanks to a Kieren Rodgers equaliser at Burton Park Wanderers. It’s 14 Evo Stik Division One South matches unbeaten for Spalding as second-half strikes from Tom Waumsley and Jack McGovern saw off lowly Rainworth Miners Welfare. The Tulips moved up a place to fourth. They are 10 points off the top two with several matches in hand. But Stamford’s home struggles continued in the Premier Division as they went down to Stourbridge. Stamford fought back to 2-2 from 0-2, but conceded a winning goal 15 minutes from time. Stamford 2 (og, Robbins), Stourbridge 3. Spalding 2 (Waumsley, McGovern), Rainworth MIners Welfare 0. Desborough 1, Peterborough Northern Star 1 (Avis). Holbeach 1 (Clarke), Rushden & Diamonds 1. Huntingdon 2 (Mann, Sanders), Sileby 1. Oadby 0, Wisbech 3 (Reid 2, Lunn). Wellingborough Town 2, Deeping Rangers 2 (Flack, Goldson-Williams). Yaxley 4 (Hughes 2, Carter, og), Eynesbury 1. Burton Park Wanderers 1, Blackstones 1 (Rodgers).